We began the day with a flat white and a banana bread to go from the very cool Espresso Embassy before heading off to Parliament. A lovely, relaxed and authentic cafe, where the owners are quite clearly passionate about good coffee. 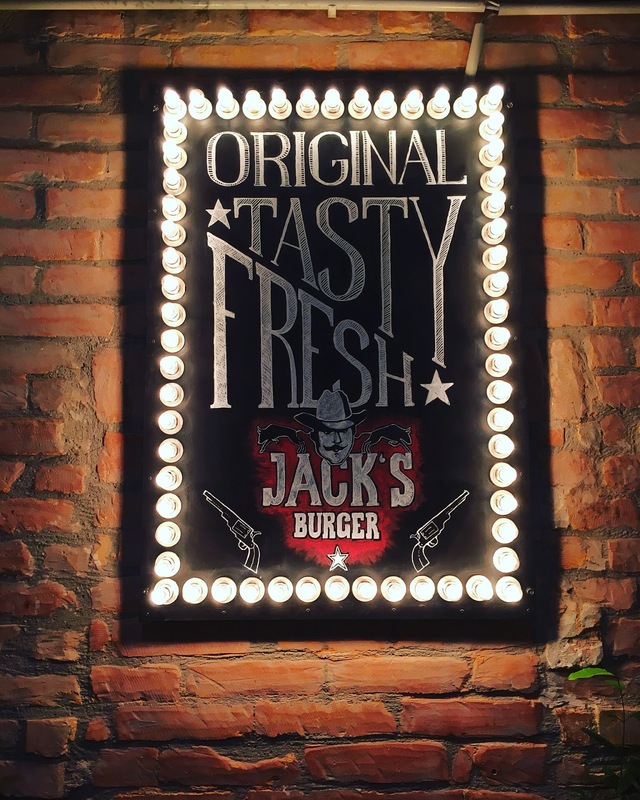 For lunch, we went to Jack’s Burger – somewhere with great tripadvisor reviews and a Pinterest fav. Smashing, authentic American burgers, served in a cute little paper tray with proper American fries. Bloody loved it. I (of course) went for the fried cheese ‘vega burger’, which was pretty damn amazing – almost halloumi like, with an incredibly little sauce and fried onions. I was in one of those food induced weird states of mind, where every mouthful is greeted with an intense nod of the head and an ‘mmmmmmm’ sound, as if it’s completely different from the last. A had the cheese burger and responded to my nods, as appropriate. As well as burgers, Jack’s sells pizza by the slice and fried chicken and fish. Nice. We followed Jack’s with a trip to Gelarto Rosa because it was pretty much next door, and I’d been dreaming of this moment since we first booked our flights. 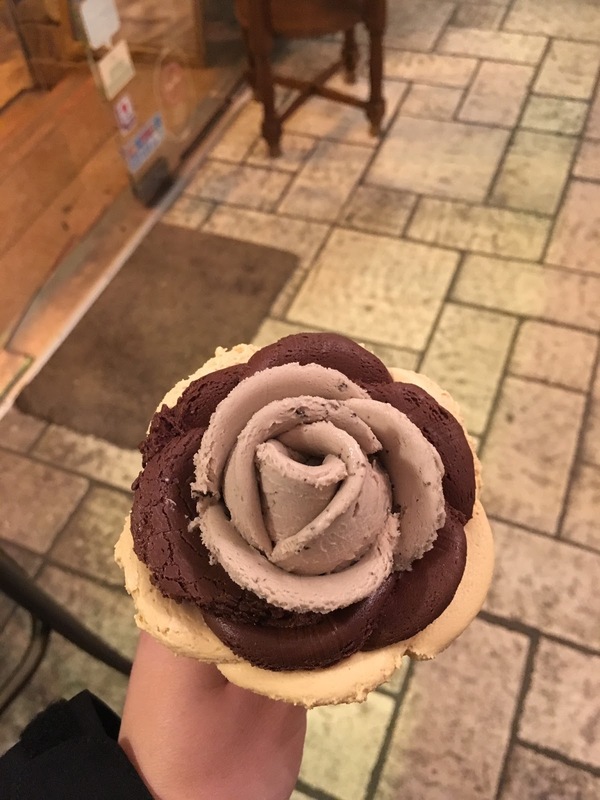 Gelarto Rosa, is a beautifully quaint and…unique little ice cream parlour, that sells ice creams (as well as waffles etc) in the shape of roses. There isn’t a huge selection of flavours on offer, but that doesn’t matter, as you can choose up to four different flavours to make your flower. We had chocolate, mango and Oreo, although in hindsight, I should have gone for salted camamel instead of the mango. For three flavours, we paid just under £2. I love this country. 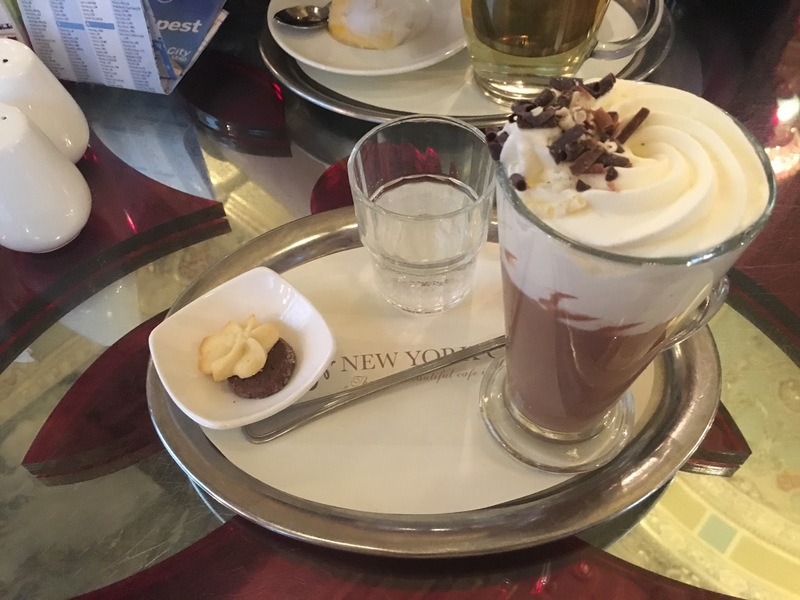 Due to the horrendous weather, we decided to continue our tour of ‘Foodapest’ and visit the renowned New York Cafe – which proclaims to be ‘the most beautiful cafe in the world’. Now, we only called in for a drink – I had a hot chocolate, A had a mint tea…and don’t get me wrong, it is a beautiful setting. Stunning building and decor, with a resident pianist tinkling away, but we have enjoyed coffee in nicer settings. This makes me sound like a right snob, but when you have taken afternoon tea at The Ritz or The Dorchester, it is hard to find anything else that compares. It is definitely a tourist hot spot and one for a good Instagram photo, but I would argue that it is over priced and not as life changing as it makes out. Now, moving on to something that WAS life changing. The outstanding Comme Chez Soi. After reading the gushing tripadvisor reviews, I wondered if this little gem was too good to be true. How wrong was I? 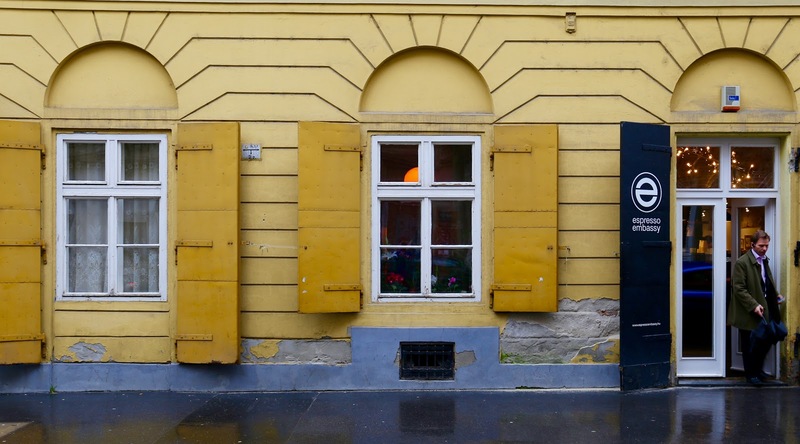 This restaurant is an absolute must for anyone visiting Budapest, but I must reiterate what so many reviewers had emphasised – you must book. This beautiful Italian restaurant has only eight tables and the waitors must have turned away at least thirty people while we were there. Some had walked miles to get there and were quite rightly gutted. Now the best thing about this restaurant – the service. We were treated like kings. So many complimentary dishes and drinks between courses, each explained in depth. Even when A had to go to the cash point, a waitress accompanied him to make sure he didn’t get lost, and I was given a magazine to read while I waited. Each course was delicious and full of Italian spirit. We had bruchetta and rocket salad to start, lasagne and salmon taglietelle for mains and shared a chocolate cake for dessert. With two glasses of wine each, we paid approximately £43. An absolute steal. We were even given a box of chocolates to take home. Day three was dry, so was all about the 9-mile trek from sight to sight. Therefore, I survived on a cheese scone, a peach ice tea and a snickers until 5pm. This is when I finally got to enjoy ‘Hot Dog Cold Beer’. I say enjoy, more like experience. No veggie hot-dog. Now, I know even the thought that I should expect a vegetarian option at a hot-dog restaurant will anger many, but this is the 21st century we are living in. Anyway, A enjoyed a ‘New York’ dog, while I went for the chips on stick. 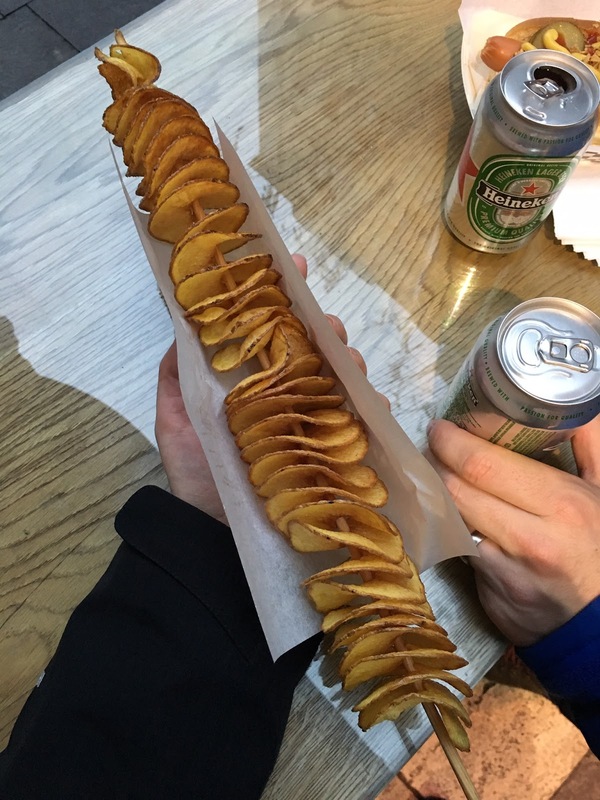 Literally, a whole potato, spiraled into crisp thin slices, skewered and fried. Actually, not too bad. Unfortunately though, the draft beer wasn’t on, so we had to go for a fairly warm tin of Heineken instead. It was cool to stand outside however, and enjoy our hot-dog (crisps on stick) and warm beer, while watching the sky darken over the Basilica. Dinner at Padthai Wokbar was really cool. Leading away from the Basilica are some really lovely little restaurants and this really took our fancy. You choose your noodles, up to four toppings and a sauce and your food is ready in around 5/10 minutes. It’s all cooked fresh, and the place had a real cool buzz. Lots of people, lots of locals and a really good vibe. 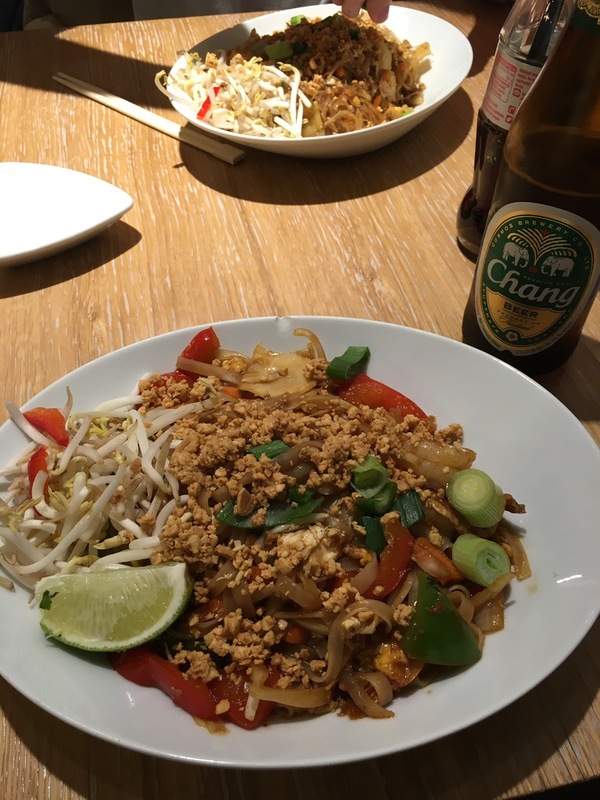 The Padthai was delicious too, washed down with a chang beer, and lots of reminiscing about eating street food in Bangkok. A cheeky little return to Gelarto Rosa, to make amends for the mango slip up. This time: salted caramel panacotta, chocolate and Oreo. Winner. 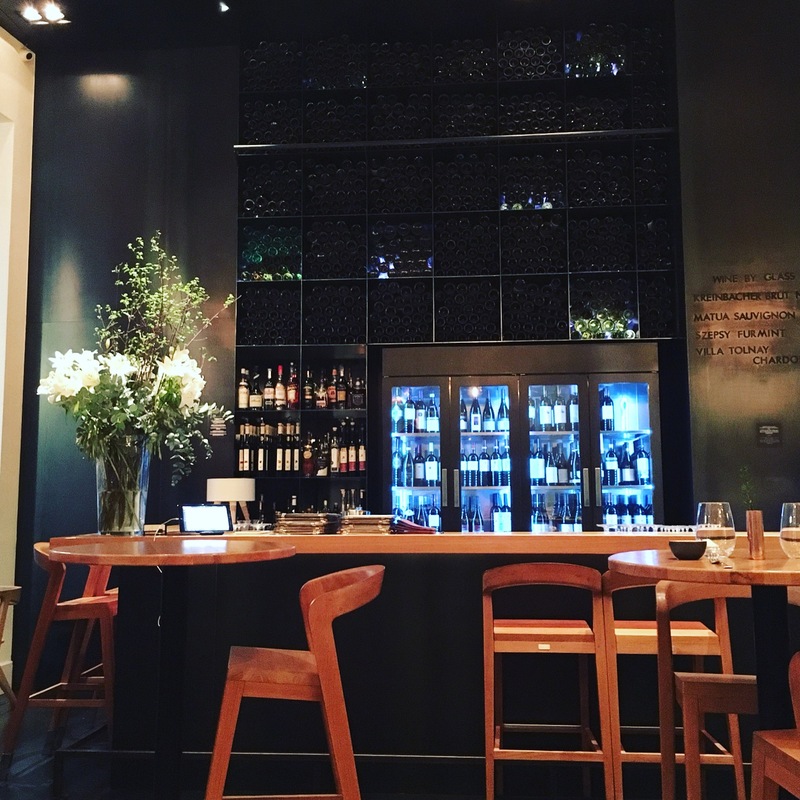 Finally, a well-deserved glass of wine from DiVino Borbar, a contemporary little wine bar that houses a huge collection of wine. We tasted the wine before we chose, and reading reviews online, the bartenders will happily let you try as many as you want before you find the one for you. 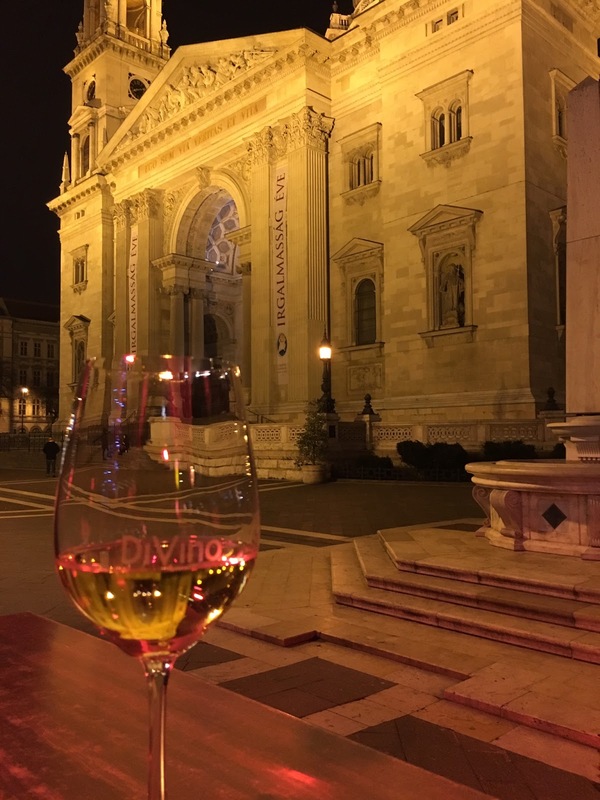 It was busy and lively inside, so we opted to enjoy ours outside, with the beautiful backdrop of the Basilica. We did discuss how sitting on high bar stools, on the edge of a platform could prove costly for those that choose to indulge in several glasses. 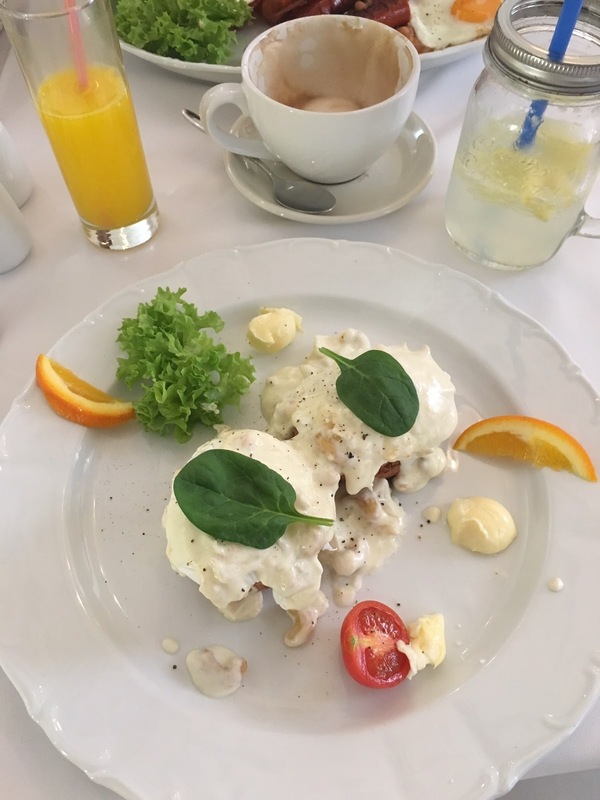 After checking out, we headed to the quaint ‘A la Maison Breakfast and Brunch’, a family run restaurant, with an extensive breakfast menu. Quite frankly, there was almost too much on their cute looking menus, which were not organised particularly well. I thought I had decided, to turn the page and find another list of mouth-watering dishes. After much deliberation, I decided on the eggs Florentine, with a twist. 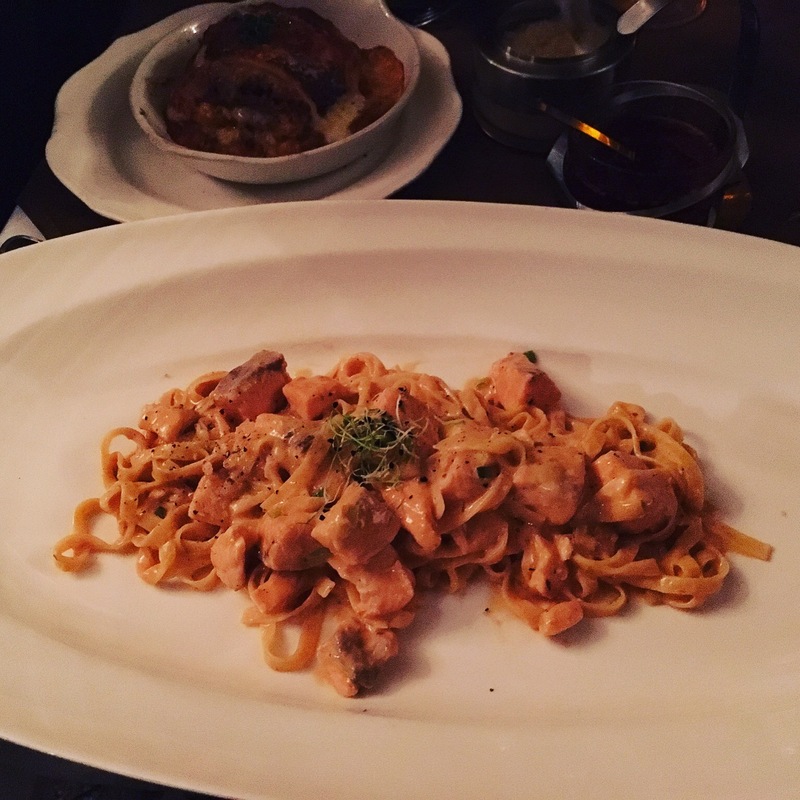 It was served with a Camembert sauce and cashew nuts – an interesting combination. A nice little restaurant, didn’t blow me away and wasn’t particularly cheap in relation to general food costs in Budapest, but it hit the spot. 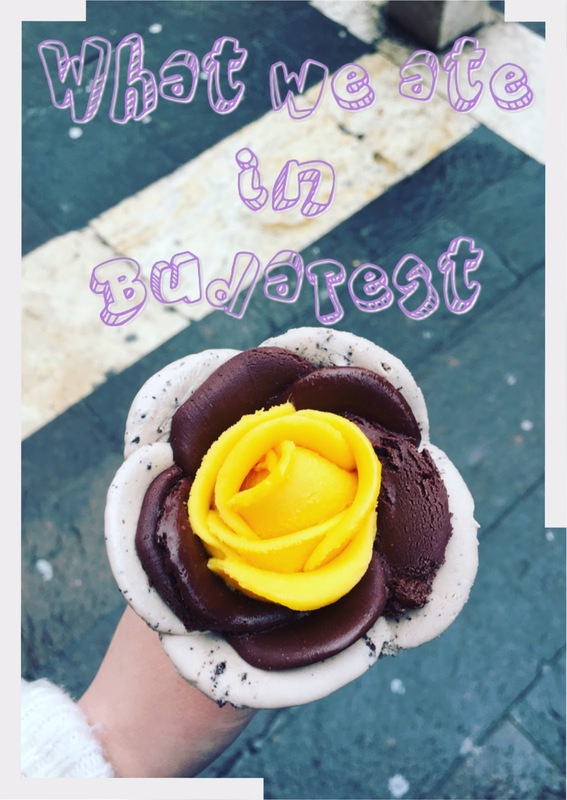 Budapest really is an incredible city and the food (as I am sure you can tell) was a highlight. I would love to know whether you have eaten at any of these places and what your views are? What did I miss? Loops Does Blog at WordPress.com.